On land or in the deep blue sea, we are all connected-and we are all a part of a grand living landscape. Packed with clear, simple science this informative, joyous book will help children understand and celebrate the astonishing role our oceans play in human life. This is a real WOW book. It is one of a relatively new trend of narrative non fiction titles. 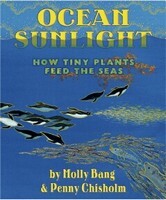 This book looks at how the sun provides light, and how this light is turned into life in our oceans. It begins with plants on land and it explains that photosynthesis is plants making life with light, and how these plants form part of a food chain which includes us. The book then poses the question, Where are ocean's plants? Some ocean plants are easy to see, like seaweed, but what about out in the open ocean, where all we can see is ...blue water. Now we start to learn about phytoplankton, and their valuable role in the oceans eco system, but also the part they play in providing us with the oxygen we breathe. We move from the surface of the ocean to the deep deep deep sea, where the creepy looking creatures live. I found out what 'marine snow' is, and how the sunlight makes the nutrients at the bottom of the sea rise to the surface so that the phytoplankton can use them again. This book is beautiful as well as being extremely informative, an uncommon mix in non fiction. The main text in the book is simple and straightforward, and the illustrations are stunning. Many people may steer clear of a narrative non fiction title because although the information is all there, it's not set out with headings, labels or fact boxes. I think a book like this can be used as an introduction to a topic, and for that, it's perfect. It will provide a lot of answers, but will also prompt more questions. There are quite detailed notes at the end of this book (6 pages worth) that provide further information on the ideas covered in the book. Molly Bang has written a couple of books similar to this one, My Light, how we transform sunlight to electricity and Living Sunlight, tells how plants use sunlight to make food and therefore make food for all life. Even looking past the usefulness of this book in the classroom setting, I think it will be popular with children who chose to read information books for for their own interest.